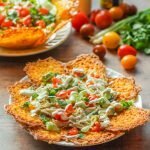 These low carb keto chicken nachos taste great as a taco salad to0! Making chips and taco shells out of cheese is the perfect vehicle for making Mexican dishes such as these. Either as nachos or a taco salad there is only 2.6g net carbs! Note recipe will make two plates of nachos with 8 chips each or two taco salads. In a bowl mix the sour cream, lime juice, garlic and zest. Refrigerate until ready to use. Line a cookie tray with parchment paper or a silicone mat like this. Add mounds of cheddar cheese using 1 tablespoon full. to the cookie tray. This recipe will make 16 chips from the 1 cup of cheese. Bake for about 8 minutes or until the cheese gets nice and crispy. Add the cheese in 2 large circles on the cookie tray. Bake for 10-12 minutes until the cheese is nice and crispy but not burnt. Take it out of the oven and lay over a soup bowl. Shape into a taco salad shell and let cool. This recipe will make 2 taco salad shells. When cheese has cooled add the toppings and then spoon a little lime crema on top!